Turbulent coherent structures in the clear atmospheric surface layer are sometimes revealed by REAL. The following animation was collected by the NCAR REAL at the U.S. Army's Dugway Proving Ground, in Dugway, Utah, in 2005. The aerosol backscatter data has been high-pass median filtered to remove effects of attenuation and shot-to-shot laser pulse energy variations. 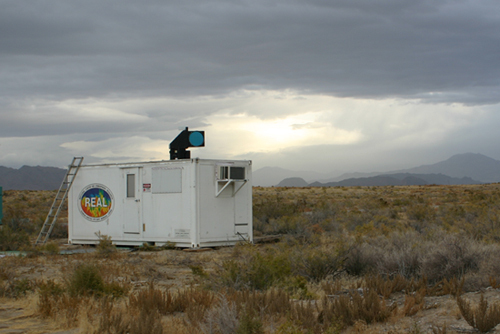 The animation shows a 70-minute period of time between 3:52 - 5:02 UTC when the lidar was scanning nearly horizontally. Range rings are drawn in 500 m intervals. 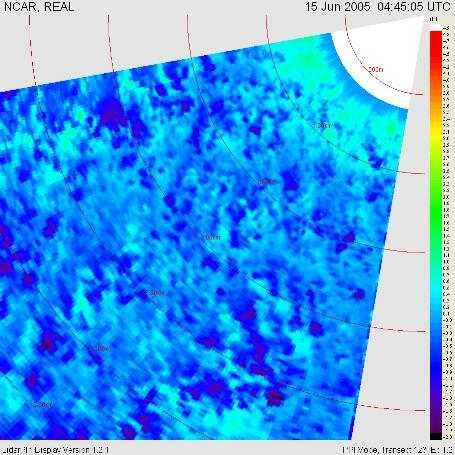 Observations like these inspired Dr. Mayor to propose deploying the REAL at the 2007 Canopy Horizontal Array Turbulence Study (CHATS) to search for more turbulent coherent structures and develop a better understand of what causes their appearance in the lidar data.